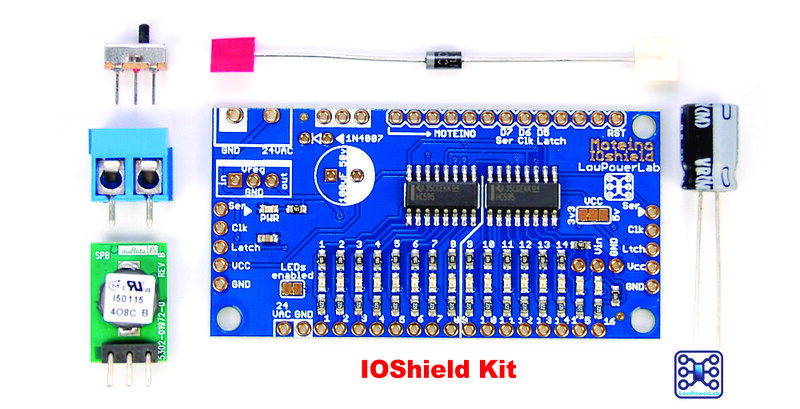 IOShield allows 16 outputs via two 75HC595 shift registers, and controlled via only 3 Moteino/Arduino pins. Each output goes through a 220ohm resistor and lights up an LED for visual feedback. Sample control, video demo and code are here. Optionally you can add the 24VAC input package, which allows you to power this unit externally directly from 24VAC, very convenient when you want to replace something like your old sprinkler controller. 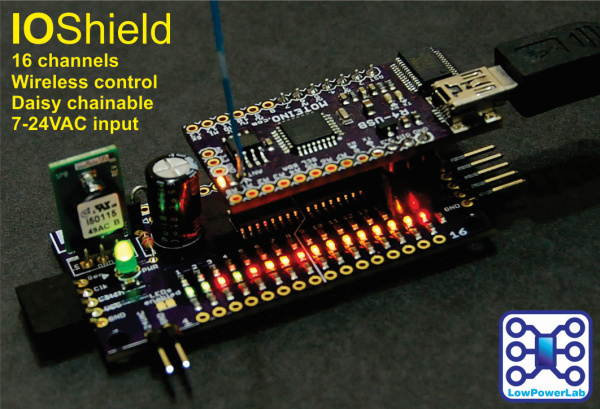 Pair this with Moteino to achieve wireless control. You can daisy chain multiple IOShields for multiples of 16 outputs, controlled via a single Moteino (only first unit in chain needs a Moteino). Default working voltage is 3.3v from Moteino "3.3" pin - this powers the registers, LEDs and outputs. You can select another voltage (5V from buck regulator or external voltage) via solder jumper.